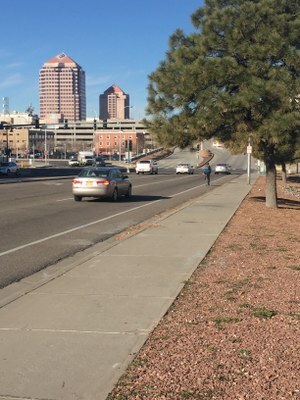 This project's objectives are to enhance bicycle and pedestrian connectivity between the University of New Mexico and the downtown area for motorists, pedestrians and bicyclists. Why Dr. Martin Luther King Jr. Avenue? This roadway is one of the main entry ways to downtown for many commuters. The City of Albuquerque is constantly developing plans to improve roadways and pedestrian accessibility. Through engineering and traffic studies, the City of Albuquerque is looking forward to providing a more efficient roadway for commuters. As new treatments will be added to the roadway, we urge motorists, cyclists and pedestrians to pay extra attention to each other. University Avenue to Broadway Boulevard. Narrowing the driving lanes from 13 feet to 11 feet will aid in traffic calming. A 4-foot buffer between the bike lane and driving lane. This high contrast paint will be added to all signalized intersection approaches. Green paint will provide increased visibility to drivers and cyclists alike while also providing a slip resistant surface to allow cyclists better traction in inclement weather. Bike boxes will be located throughout the corridor at multiple intersections. A bike box is a designated area at the head of a traffic lane at a signalized intersection that provides bicyclists with a visible way to get ahead of queuing traffic during the red signal phase. 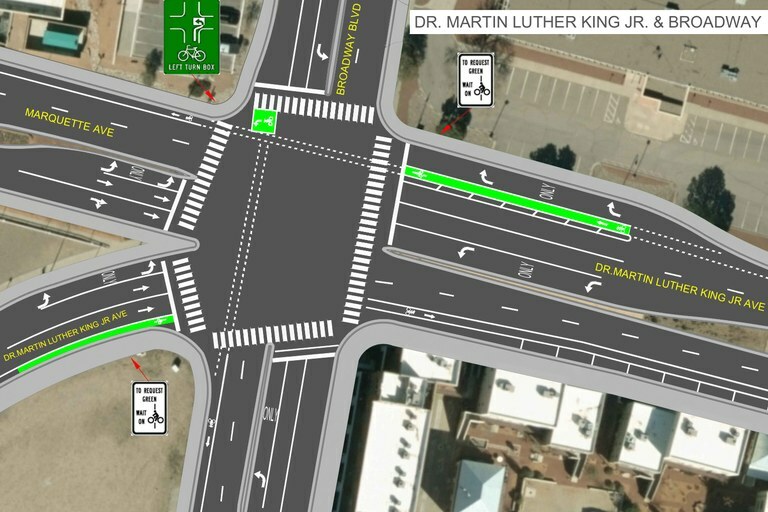 A two-stage bike box will be added to the intersection of Dr. Martin Luther King Jr. Avenue and Broadway. When traffic signal is green, proceed from the westbound Dr. Martin Luther King Jr. Ave. bike lane through the intersection to the green bike box. Face your bike southbound and wait for the signal indication in front of you to turn green. Ride southbound across the intersection in the traffic lane, not the crosswalk. Driver's should stop at the stop bar prior to the green bike box. Click here to download the Two-Stage Bike Box PDF.